A few weeks ago, we shared with you the new collection from Matthew Williamson for Osborne & Little and promised that a blog showcasing the equally beautiful new collection from Nina Campbell would be coming up shortly, and here it is! As promised this blog is dedicated to showing off the glorious new autumn collection, Coromandel, by Nina Campbell. This collection follows the same elegant and inspiring motifs that always feature in a collection from Nina, Coromandel makes valuable use of zingy blues, sharp greens and hot corals, as well as a whole load of new and exciting prints that will give you home a huge burst of exotic flavour! This playfully embroidered print is every party animal’s dream. As the name suggests, inspiration for the fabric came from the Mardi Gras festival, which is reflected in the colourful chevron pattern. The textural piece is great is you lovely a bit of contemporary bohemian chic, the bold print will really make a statement contrasted against other patterns. Or, if you want to vibrate but calmer setting, the Mardi Gras fabric placed in a neutral setting will really give your interiors a pop. The Pavilion Gardens print from the collection is a thoughtful and pretty pattern, we love it so much we bought a metre to frame and hang in the office! The scene depicts women in sari’s picking fruit in a garden. The various colourways with this print allows you to work it into various interior styles. The pastel colours can be used in a contemporary or traditional setting, and the blue and white, which resembles the traditional blue and white Chinese porcelain can be used to create an ancient Oriental style theme in a modern and interesting way. The Meredith pattern takes a print first used by Nina back in the nineties and reworks the style in new, contemporary colours. The damask pattern, which is usually considered traditional, has been craftily paired with strong, modern colours like an icy grey and snappy coral to make it work in a contemporary setting. Calypso is a simple, but absolutely stunning semi-plain from the collection. The dotted ombré effect creates a wonderful graded glamorous style from a distant and up close an intriguing composition. The dusty rose is gorgeous and the perfect fabric if you want to spruce up a chair or sofa. One of my favourites from the Coromandel collection is the Perdana fabric and wallpaper. The birds and branches imagery is depicted in a beautifully artistic manner, by the use of small colourful dashes, creating a wonderfully unusual and intriguing style. This pattern is marvellous and its light-hearted nature means it can be used in all sorts of ways, from cushions to curtains. Another of my favourites is the Palmetto design. Considering that palm trees are featured rather heavily in today’s design world, Nina finds a fresh take on the motif, creating columns out of the palm leaves. Nina comments on the design, “I love the architectural quality of the design”, the Palmetto design is a great way to add a hint of the Caribbean without going overload on the theme. Lastly, the Coromandel’s namesake is a vividly coloured ‘Tree of Life’ embroidered pattern. The pattern is given a new lease of life and modern revamp with the use of viscose in the embroidery to create a shimmering effect. The dramatic red and electric blue are perfect for those who want to create a showstopper, and the laidback pastel colourways are ideal if you just want to the bold pattern without the bold colour. For a lively, exciting festival of colours complemented hugely by delicate and elegant patterns and prints, the Coromandel collection from Nina Campbell hits the nail on the head. Each fabric and wallpaper is more playful then the last, and if you’re looking for some fun in your home you’ve come to the right place! Last week we were paid a visit from our wonderful rep Lizzie from Osborne & Little, who showed us the new collections from Nina Campbell and Matthew Williamson. Both collections were absolutely outstanding, and both definitely worthy of their own blogs, so stay tuned for Nina’s glorious fabrics and wallpaper, but for now take a look at the new collection by the ever-so talented Matthew Williamson! The overall theme of Matthew’s new collection, Durbar, is based on his travels to India. The collection is enriched with exotic influence but approached in a modern, stylistic way. Taking the best from old, historic tones and integrated with a new vision, what you end up with is a truly wonderful pool of gorgeous fabrics and wallpapers. The Menagerie design, first shown as a fabric and below as wallpaper is even more stunning in person. Full of exciting details and colours, the pattern is a real showstopper, as Matthew comments on the piece, ‘I love the hot house tones, and the fresh mint, lavender and lime’. 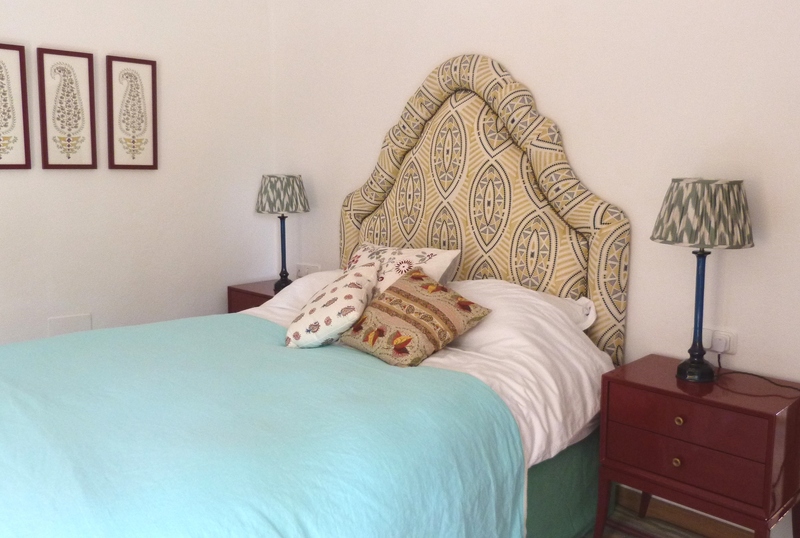 Its zingy style makes it ideal for those who are willing to take a risk, whether you want to spice up a sofa with a few cushions in the print, or perhaps a dramatic roman blind, or if you’re feeling bold, deck out a whole room with the wallpaper. If you are at all familiar with Matthew Williamson you’ll know he has a fascination with peacock feathers, and they regularly feature in his work. For this collection, he’s used his famous inspiration but tweaked it so that it is in keeping with the overall style of Durbar. Azari is an interpretation of peacock feathers in a lacy line-drawing style. The look is fresh and modern, and a real treat if you like to create a mixture of bohemian and glamour style. One of the patterns that we are particularly taken with at Angel + Blume is the Zanskar print. It’s a beautiful depiction of idyllic Indian celebrations, Matthew has commented on the piece saying, “The pattern was drawn and then painted by hand and is made up of whimsical scenes which up close show a light-hearted look at Indian life but from afar has the effect of a traditional and classic Toile de Jouy”. The Zanskar print is completely stunning, and its wonderful details will constantly put a smile of your face. The various colourways really change the way you can use the fabric, from the crisp blue and white to the rustic linen, it can be worked into so many alternative design schemes. If you have a soft spot for scenic imagery on your wallpaper or fabric, Matthew has another trick up his sleeve for you. The Aravali pattern takes its name from the Aravali Mountains in West India, which is what’s depicted on the print. A vision of rolling hills, horsemen, cows, monkeys and birds as well as some forests. The whole thing is a beautiful, tranquil design that can turn a room into a serene, picturesque dream. The Yamuna pattern is a refreshing take on the paisley print, which manages to maintain the essence of the iconic style without any outdated stigma creeping its way in. The exotic print comes in three colourways, the first darker shade works for a fresh, contemporary house, the second a light pastel is well suited for a feminine, traditional setting and the last is a wonderful rustic style, that’s great for low-key, relaxed decorum that’s looking for a hint of a seventies vibe. 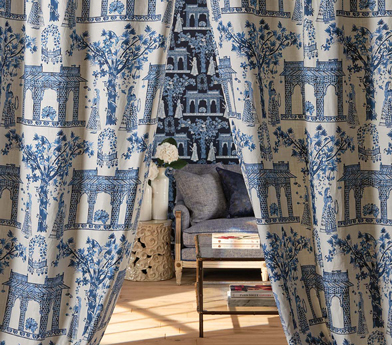 Peeking out in the picture above, behind the Yamuna fabric is the lovely, contemporary Jali Trellis wallpaper. The lattice pattern mixed with the vibrant colours creates a wonderful looks that would be the perfect backdrop in any room, be it an old townhouse or a contemporary apartment. The final delicious fabric is the Viceroy pattern, it’s a velvet applique and embroidered marigolds in vivid colours, and is rather heavenly. The dense fabric is just calling to be turned into a dramatic pair of curtains, or a reupholstered sofa, it’s a wonderful design with a great textural element to it. The Durbar collection is truly breath-taking, and whether you’re thinking about making a big or small change, or are tempted to make a splash in your home, Matthew Williamson is always something worth betting on. More often than not when faced with the task of redecorating, whether it’s a recently bought house or just time for a facelift, so many of us shy away from bold adventurous patterns and colours and head straight over to the neutrals section of any sample book and never look back. While neutral, when done well, will always been an elegant and classic decision, there’s something to be said for adorning your home with something a little more unusual. A few weeks ago I wrote a blogpost on some of the best paint companies around, and today I wanted to share the companies who have Angel + Blume’s stamp of approval when it comes to gloriously exciting and interesting wallpaper designs. For all the thrill seekers out there who don’t want to settle for plain and love a creative and vibrantly decorated interior, here are some absolutely wonderful, out of the ordinary wallpaper designs that will tick all the boxes. When you opt for a striking, daring wallpaper design, instead your wall of being just part of the foundations of a house, it becomes a work of art, and finding an artistic print that’s just right for you will not only give you so much joy but will completely transform a room. This is a wonderful, contemporary piece from Fromental, it’ll bring a bucket load of originality and create an elegant and sleek landscape right in the middle of your home. It will look striking on a long stretch of a wall, even when broken up with features such as a fireplace like above. What’s so great about this design is the symmetry between the drama of the mountain design and understated nature of the colour palette meaning either part can be dressed up or down depending on your style preference. Another company that is always a reliable source for art-like wallpaper designs is House of Lacroix via Designers Guild. Vivid, snappy designs that don’t shy away from colour, Lacroix wallpapers will excite anyone who sees them. The latest collection ‘Incroyables et Merveillesuses’ has some truly show-stopping patterns that are perfect for awakening your wild side. With a visual impact like no other, the Bagatelle design, which takes inspiration from the Parc de Bagatelle just outside of Paris, will inject life into your interior and is a superb way to show off of your courageous and inventive style. For an equally floral and fruitful design, but with a more regimented pattern, Timorous Beasties have a lovely design that coordinates wonderful scenery into contemporary vertical stripes, making it the ideal companion for anyone looking to integrate nature elements into a modern scheme without it looking too traditional. The playful vertical stripes work perfectly and add a little bounce to the interior. Never one to shy away from colour and patterns, Osborne and Little always have something rather wonderful up their sleeve, and their new ‘Fantasque’ collection is nothing short of amazing. The geometric patterns and abstract designs pay homage to the cultural movements of the early 20th century and the striking colours are just what the doctor ordered to add a little oomph to your interiors. This art deco themed wallpaper is wonderfully sultry, the rich colours and bold patterns make it ooze with glamour, the dramatic aesthetic would look stunning in dark and cosy den. Another vertically striped marvel is this Tamara De Lempicka inspired pattern which has a lovely vibrant sense of movement to it. If you love a vivacious colour palette but find traditional prints and patterns more agreeable with you style Waybreads is the perfect company for you. Waybreads make beautiful hand printed wallpapers that all follow a natural, wildlife motif; think a modern Morris & Co. in the making. I think the combination of this colourway and pattern is breath-taking, so rich and luxurious yet kept humble by the floral motif, it would look amazing in a long corridor or hallway. Another equally stunning design from Waybreads is this ‘Guleder Rose and Old Man’s Beard’ print. With a lovely backstory as its inspiration and the extra added touch of being hand printed, there’s a real uniqueness about the design that will really give your home a wonderful welcoming spirit. If you’re looking for something that has the same amount of style and impact but in more of a subtle tone, there are plenty of styles and designs that will get you your fix. Designers Guild have a beautiful fading design that is the perfect balance between neutral and experimental. There’s a balance of sophistication and elegance as well as fun and contemporariness that creates a modern nod towards a classic interior. Fromental have a delightful geometric design that uses a subtle palette, which is perfect of those who want optimum style without being over the top, the Moorish architectural it takes influence from a classic, elegant style that won’t appear dated, and the use of the blue tones and shading give the design an almost three dimensional effect. So if you’re thinking about spicing up your interiors, why not dive in head first with some outstanding wallpaper designs that will truly make your home shine with originality and excitement.